Shown above: 1 Washington Rope Outdoor Loveseat, 2 Washington Rope Club Chairs, 1 Blok Concrete Rectangle Coffee Table, and 1 Elle Relaxing Chair. Epitomizing modern luxury, the Washington Rope Outdoor Furniture Collection is making waves as a chic new patio set from Teak Warehouse. Washington exudes grandeur in a contemporary package of the best materials, designer style, and high quality comfort. 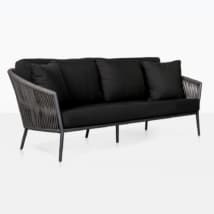 Curate a space for yourself that is exceedingly fashionable, luxuriously comfortable and is comprised of the best quality outdoor furniture, all made from high-end European Rope, aluminum, with Sunbrella® cushions. Washington features 5 unique pieces that make up this set of luxury patio furniture, from the elegance of the Washington Club Chair, to the spacious outdoor Sofa, Loveseat, Dining Chair to the beautiful Bar Stool. 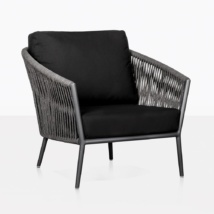 Featured in the image above along with Washington is our Elle Wicker Relaxing Chair. Each item from this modern collection of garden furniture blends a mid-century style with a more simplistic urban look. Stunning curved arms with slim legs on an aluminum powder coated frame, wrapped deliciously with new outdoor Rope and topped off with amazing Sunbrella® cushions with QuikDry® foam. These are pieces that make you want to climb into them and stay for hours. Why not fill your gorgeous garden with the Washington Outdoor Collection? Start with the exquisite Washington Sofa, framed either side by two of the beautiful Outdoor Loveseats, and place a couple of the Club Chairs in for good measure, choose one from our amazing range of Coffee Tables in Concrete, Teak or Aluminum and you have an instantaneous leap into luxury! Need to complete your dining area as well? Purchase a Dining or Bar Table and surround with the magnificent Washington Outdoor Dining Chairs or trendy Bar Stools. The look will be so contemporary and cool, the comfort second to none, and you will pleased with the purchase of long lasting, top quality patio furniture! 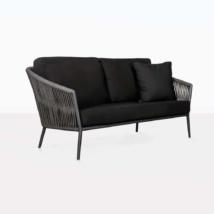 Shop online or Call one of our stores to purchase the Washington Rope Outdoor Furniture Collection today. Our sales staff is ready to answer the phone and any questions you have.